Dear Dumb Diary - Year 2 - Book 1 - School. Hasn't This Gone On Long Enough? 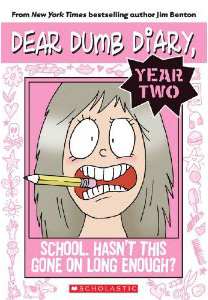 Home > Dear Dumb Diary > Dear Dumb Diary - Year Two #1 - School. Hasn't This Gone On Long Enough? When Dad brought it up this morning, I pointed out that I'm doing well in all of my classes except math. And Dad was all like, "You have to do well in all of your classes." And I was all like, "Who really needs to be good at math, anyway?" And Dad was all like, "I do. I'm an accountant. It's my job. It's how the bills get paid around here." And I was all like, "Dad. If everybody was good at math like you, they wouldn't have had to hire you. Face it, the less people everywhere know about math, the better off our family is." And Dad's mouth snapped shut like a big old math textbook. He looked helplessly at Mom. Yeah, that's what I thought, Math Guy.